Will there be a Montage-forum at motifator in future? For a Montage forum, go here. A lot of very loyal Motif users that have supported this forum over the years are moving to the MONTAGE, the successor of Motif line. (And some will be using both). A forum exists for the various Motif instruments. Why not one for the MONTAGE? Yes, and the Motif forums are there, also. That is exactly what I mean! I am waiting for my Montage-7, too and would be glad to get support as it is here for the motif. Of course I also will add my knowledge and experiences to all others. We have had a dedicated forum for Montage since before it’s release. I’m surprised there isn’t a Montage section here. There is a lot of expertise on motifator.com and I’m pretty sure a lot of Motif users will be either migrating to the Montage or adding it to their existing kit. Surely a Montage section would be very useful? I can see where your coming from with this and your right, there are plenty of synths out there and if you try to cover them all you lose focus and that’s not good for the people who come here. I’m sure Motifator visitors will eventually start posting questions but as you say there is the general forum for that so the expertise is still there...in general terms should people need it. I think people were asking about a Montage section here simply because in Motifator.com they have found a good home on the internet with people who’s opinions and expertise they trust and so they would feel more comfortable staying here that going off and joining a completely new community. Anyway thanks for explaining why you have not implemented a Montage section. I agree with Mr. Motif. My disappointment with this event regarding the out-of-production and end of the Motif line is growing. The LG 800 stand, of which I purchased two of over the years, has gone up to $399 from $299 with reasoning I yet to get. This has nothing to do with anything I only stated the fact. 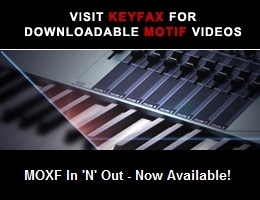 As for Motifator and Keyfax, I’m a fan and so are our friends here. The headphones, pedals, etc. that we’ve bought from the Motifator Shop were fine product. No problems. Will purchase there again if needed. In closing, the Montage fans should not feel left out without a forum. I respectfully disagree with MrMotif, on pretty much all levels. MrMotif, I bet your your website analytic tools prove that people are coming here en masse to look for Montage info. So, in actual fact, this site already is supporting Montage. You may as well embrace it, even if you do it just a little bit. Why? it brings you traffic, if nothing else. A single forum rung for the Montage, even buried down the list, wouldn’t change the face of this very obviously Motif oriented site at all. All it would do, is make the place a bit more organized because the threads exist anyway. It may also bring Montage owners in touch with the Motif, too, and then your shop. It would be no more or less related to Motifs than DAWs are, and they have their own rungs. As do the S90, MO, MOX and MOXF. Consider this! Religion rears it’s very ugly head in this forum quite commonly and all the good people are asking for is a Montage forum? By your very own logic MrMotif, the Mo Lounge should be deleted at once. It is much more off topic for this web site than any Montage rung could ever be. To be fair Yamaha themselves class the S90, MO, MOX and MOXF as part of the “Motif” line so in that respect I can understand why they have their own sections on this forum. Montage on the other hand is, according to Yamaha definitely NOT part of the Motif line and indeed is the replacement for it. I know from my own discussions with Yamaha that their is a replacement for the MOXF in the offing and this will be a cut down version of Montage. So they are clearly putting Motif behind them and moving forward in a new direction. On my part this is not unexpected. Motif has been going a long time and whilst there is nothing essentially wrong with it, times change and there are a whole new generation of musicians out there for whom Montage fits the bill where something like a Motif XF or MOXF would not. Motif still has a lot of legs in it and this forum will be relevant for many years to come. If you take my own forum as an example we started out supporting the SY85 and we still do. It’s still being used today along with other great Yamaha keyboards such as the SY77, SY99 and EX5. These great keyboards, like Motif don’t simply die out, we just add to them and that’s the way I see Montage, as a new addition to what we already have. I understand why a Montage section is not being added to this particular forum, because it is simply not ‘Motif’. You may as well add a section for the Korg Kronos or Roland JD-XA. Perhaps at some point in the future things will change and Motifator.com will start covering Montage but for now there is no need. There is plenty of coverage for Montage out there already. Blimey, I can tell you’re a SysOp. I’ll let you off about your smugness in pointing out to me what constitutes a Motif or not, even though you completely skipped my mentioning of the fact that Motifator also has various DAW sub forums! Saul, just take a look around. Motifator IS supporting the Montage. There are currently hundreds of posts about the Montage. I sincerely doubt anyone here believes that Motifator should ditch the Motif in favour of the newer product. What I believe people really want is just some organization of Montage stuff, and really, that organization doesn’t need to mean that Motifator officially supports the Montage. Surely, that is better than randomly strewn Montage posts midst a continually morally repugnant forum like the Mo Lounge. A better user experience does not have to damage the evidently delicately balanced corporate politics of Motifator.com. The current arrangements for Montage here provide a poor user experience and sound mealy mouthed. That’s not a good look for anyone and it’s enough to make people move on. The idea that Motif has many great years left is true, but the idea that people will continue to visit a confused forum is not. Well must put my hands up to that ;) I did forget you mentioned the DAW thing and yes you definitely have a valid point there. Can’t say I have a reasonable answer for that one. The only thing I would say is on my own forum we have had people ask for sections to be created and they have assured me they would contribute etc etc but it’s clear that after creating these sections there simply wasn’t the interest to justify having them. Although our Montage forum has thousands of views and currently runs to 20 pages the actual “input” from users is limited. Now that could simply be because the number of people who own a Montage is relatively low at the moment or because owners are happy with what they have and so don’t feel the need to post in a forum, who knows? I haven’t looked through this forum yet to see what questions people are asking about Montage and I will do that in a moment but from my own experience they tend to centre around the differences between Motif and Montage and why certain things have been left off the latter. They are normally not from owners who are stuck with trying to do something. Yamaha themselves provide plenty of support in that regard. We provide as much support as we can and I am pretty familiar with how Montage works but I am not an expert on it by any means, same as I’m not an expert on Motif which is why we often send people here. Would it hurt to have a Montage section? probably not but it is a bit of a slippery slope once you start adding things and I do speak from experience! Anyway it’s not our decision and the owners of Motifator have decided on a certain policy and there it is. I don’t think they will change their minds in the near future. Hopefully this is fine by the forum’s moderators. We have a new “Unofficial Yamaha Montage Community Forums”, this new forum should be unbiased, unaffiliated.